International Day of Women was just a month ago. The theme for 2019 was #BalanceforBetter; A balanced world is a better world. In the church work needs to happen for a gender balanced world. The PCUSA Advocacy Committee on Women’s Concerns asked that Presbyteries share the following information from a PCUSA Research Services’ Presbyterian Panel on Gender and Leadership in the PCUSA. The overall take away from the study is that a lot more work needs to happen for gender balanced world in the church. Gain a deeper insight into the varying experiences of men and women in ministry, including similarities and differences in compensation, career trajectories, and decisions to leave ministry. 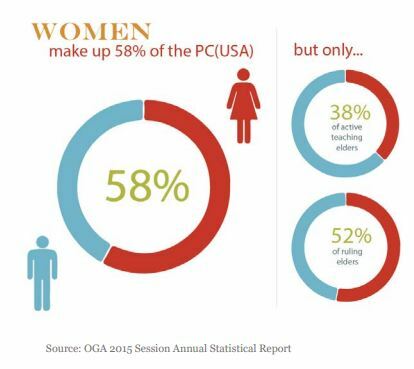 Gender and Leadership in the PC (USA): Summary of Findings from the Presbyterian Panel. There are two main findings from this research. First, gender discrimination is still pervasive within the PCUSA and second, almost half of the members are not particularly aware of it. Eight out ten female teaching elders have experienced discrimination, harassment, and/or prejudicial comments due to their gender, and four out of ten feel that they have experienced gender bias in hiring, promotion, or selection for an official position with the PCUSA. However, almost half of members disagree with the statement that “gender inequality is still a problem in the PCUSA.” This is likely because, among members, the problem is less pervasive: only 30% of women and 13% of men report experiencing gender discrimination, harassment, or prejudice. Gender inequality does still exist among members and can be seen in the fact that female members are less likely than male members to hold official leadership positions. Gender parity in leadership is only evident once unofficial leadership positions held in a volunteer capacity are entered into the equation. And then once that leadership position is attained, women tend to struggle more than men with various issues related to being a leadership. Where are women doing the work of leadership? More is expected of women than of men in similar roles. For example, female teaching elders are asked more often than male teaching elders to lead workshops, programs, or other activities, and are more often asked to serve in childcare and kitchen roles. To what extent are women accepted as leaders in the PC(USA)? 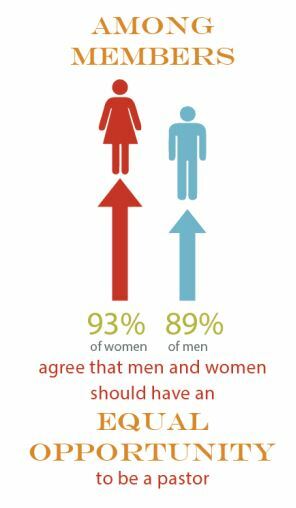 Although 89% of men and 93% of women agree that men and women should have equal opportunities to be a pastor, only 73% also feel that way about their pastor. Those with a preference tend to prefer a pastor who matches their own gender identity. Most Presbyterians feel that men still have a better chance than women of being called to the position of head pastor, which suggests that while most Presbyterians think women and men should have equal opportunities for leadership, they recognize that this is not the reality. When presented with a list of essential pastoral traits and asked if they are a greater strength of men or women, slightly less than half decline to apply a gender stereotype. Of the small majority who feel that these pastoral traits are gendered, women tended to think of the traits as greater strengths of women, and men tended to think of them as greater strengths of men. How are women in leadership positions treated compared to men? Eight out of ten female teaching elders in the denomination have experienced gender bias in the form of discrimination, sexual harassment, and/or prejudicial statements. Almost three out of four female teaching elders have had a harder time in being accepted in leadership roles within the denomination due to their gender. Four out of ten female teaching elders feel that their gender has contributed to their being overlooked for a promotion to a higher-status position within the PC(USA). Men are not completely free from experiences of gender bias: 32% of male teaching elders and 13% of male members report experiencing some form of gender bias against them. Read the full study to learn more what was learned through this Presbyterian Panel. There is work to be done – Let us continue the conversations.